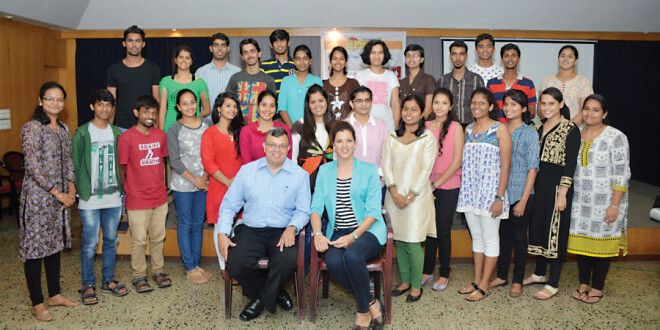 Planet J in its continued mission of bringing value to its readers organised a workshop on grooming and etiquette on July 26 at Dempo House, Panaji. Open to the age group of 16 to 23, the workshop aimed at giving Goan youngsters some important tips on grooming, social graces and etiquette. Seventy two youngsters participated in the half day workshop conducted by Charmaine Shakleton Godinho and Andre Shakleton of Chrysalis Trainers. Andre worked on the conditioning of their minds and what the participants needed to do to develop the requisite skills to groom themselves and then present themselves to the world. He used some very innovative exercises to introduce the participants to how their mind works. In an exercise with dots and lines Andre indicated the need for out of the box thinking to face a challenge and the fastest way of resolving the same was also revealed through a dance sequence. This had the youth engrossed and entertained at the same time. In a competitive spirit the participants pushed themselves to do the best they could. Charmaine on the other hand gave out some very valuable and practical tips on what to wear, what to say and how to behave when presenting one’s self. Her examples and stories had the group hanging on to every word she said and this was evident from some very intriguing questions being asked on social behaviour. Charmaine not being one to stand on stage or behind a podium was down in the middle of the audience demonstrating what poise and posture meant and teams were made to experiment with the same to much laughter and enthusiasm. The participants eagerly absorbed all that was said and demonstrated. It was difficult waking up on a Sunday morning for a workshop but the experience was totally worth it. It was a good interactive workshop and met with all my expectations. All my queries were also answered. The workshop was excellent as it will help develop our personality. The workshop taught us how not be crass and different etiquettes that we should follow. It was a fun-filled workshop and we learnt a lot and enjoyed the activities. We also learnt a new dance. It was a brilliant workshop. It was an amazing workshop and I had a great time. Please have more workshops. In four hour I gathered a lot of knowledge that will help me for the next thirty to forty years, actually for the rest of my life. It was amazing and fun. I now feel more confident about myself. It was a very knowledgeable workshop and couldn’t be more fun. I shall try and put what I have learnt into practice. Thanks Planet J and Ms Godinho. The workshop has taught me a few tips in how to become polished and feel not only confident but also good about myself. I learnt a lot and the instructors were very efficient and friendly. Thanks Planet J for organising such a wonderful workshop. It was a Sunday really well spent and the experience was amazing. Thanks to Ms Godinho and Mr Shackleton and of course Planet J. Feel the confidence level already shooting up after the workshop. Thanks to the trainers for the invaluable contributions. The workshop helped me to recognise my abilities and be spontaneous. The workshop made me feel very good about myself and I also feel more confident. Indeed a wonderful workshop. Thanks a ton Planet J for organising it. Found a lot of precious tips and it was fabulous. Thank you for a super workshop. Hope you have many more. Thank you Planet J for organising such a wonderful workshop and to the trainers for conducting it so well. Since I study in Bangalore, this was my first Planet J workshop and I must say it was very interesting. Thanks to the trainers for imparting quality training to us. Hope to attend many more. It was action-packed and very interesting. Would love to also express my appreciation to Navhind Times. The workshop was enlightening and has added plus points to my personality. It was an awesome workshop and I learnt many great and new things. The workshop was an amazing experience for me. A big thank you to Planet J for organising the workshop and to Charmaine and Andre for their time and generosity. The workshop helped in making us aware of many small things which we need to do in our day to day life. I also had fun and it was very entertaining. It was a great experience and a cool workshop. Thanks Planet J.
Charmaine and Andre were fun and it was a unique experience learning from some of the best.